Have you ever started out on a journey feeling so confident you knew exactly where you were going only to find out you were completely clueless? You know what I’m talking about. You have read or heard about how to get someplace and you can picture it in your mind but when you actually get underway nothing looks as you imagined. 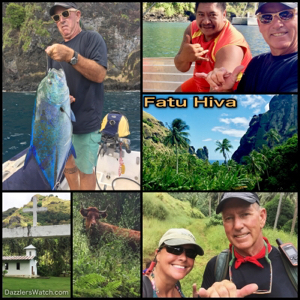 Well, we had one of those days here in Fatu Hiva which is why I originally wanted to title this article, “The Hike From Hell”. The thing is, however, we were out seeking an adventure and let’s be honest, just about every true adventure story is the result of the main characters doing something they never planned on doing, right? So, why should this be any different and why should I call it something horrible when it wasn’t really horrible so much as it was exhausting and a little disappointing? But, it was a true adventure…oh wait, I’m telling you too much, let me start from the beginning and you decide. Much has been made of the hike to the grotto and waterfall here so of course we had to see it. It didn’t sound like too bad of a hike, maybe about two hours one way at most so why not? It’s our first full day here and we are rested and it’s time for an adventure. We don our backpacks and hiking shoes and with bottles of water and cameras in hand we head to shore. What could possibly go wrong? The bay is spectacular to say the least and we are so excited to see this well touted village and it’s famous waterfall. It’s said that this is the best place to visit in the Marquesas. So far it’s living up to its reputation. As we arrive at the beach on the left is a manmade breakwater that provides a small jetty for local fishermen as well as cruisers to dock their fishing boats and dinks. Let me warn you though, when the tide is out, the wall is very high and it’s not all that easy to get off your dingy. Good shoes as well as strong arms and legs go a long way to keeping you from plunging into the water. But then this is just the first of several places where you’ll be glad you had all three. Thank God for me that Dan is a strong man as he pulls me up to the landing. With the dinghy secure and me still dry thanks to Dan, we head into town. We don’t have the greatest directions to the waterfall but, hey, it’s a small village, how hard could it be to find? After all, the river is running into the bay right beside the road and Helen of SV Nightide gave us some simple directions. It sounds pretty easy to us so off we go. There’s only one main road in the village and it leads to and from the quay so it’s hard to miss. As we head up the road we are immediately struck by how clean and manicured things are in this place. The plants don’t hang over the concrete road. No, they are trimmed yet still have a very natural feel. It’s quaint and beautiful and you instantly know you are someplace truly magical. There are so many scents that it’s almost overwhelming. You have the sweet smell of flowers and citrus combined with the crisp scent of water and yet there is this pungent, earthy smell of the forest. It’s not too sunny today so the air is thick with moisture from the clouds. It’s warm and a little humid but it’s still very comfortable. This truly looks and feels like everything I expected in a South Pacific village..
As we travel up the concrete road that runs from the wharf area up through the village, to our right there’s a small soccer field that looks out across the beach to the bay and just past that is a small church. As we continue along the road we pass the school and can hear the children singing in Marquesan. We really don’t know exactly where we’re going but we know we need to take the second left and there’s going to be a large cow with horns tied to a tree. Just after that we will find the trail head on our left. We walk through the village relishing each and every sight. There’s a small river to our right which is obviously coming from the waterfall. There are small, open air, Marquesan homes with tropical print curtains in the windows, chickens and pigs in the yard and an abundance of fruit trees. There are verigated hibiscus in bright red, these lovely, sweet smelling white flowering trees and so many more colorful flowers. They add the perfect amount of bright colors to the lush green landscape. Dogs are playing in the shallow river and villagers are tending to their daily chores of laundry, cooking and making copra. To our left we are overwhelmed by the steep, black, volcanic wall that rises high above us. It is strong and bold and wreaks of history. You can feel the energy literally vibrating from it. We continue up the road as if we actually have any idea of where we are going. A few times we stop to question whether or not we have reached the appropriate turn but never agree that we’ve found it so we continue on. Soon we reach a small bridge over the river and see three men approaching from the opposite direction. We ask if we are going the right way but they appear to speak French and don’t understand us. They hardly even acknowledge us and very rudely keep walking. We can’t help noticing they have taken mangos from the nearby trees. There are no locals nearby so it’s easy to assume they were taken without permission. One thing we are acutely aware of here is that each and every parcel of property is owned by someone and taking fruit without permission is just wrong, Unfortunately we’ve seen a lot of cruisers do it. It’s sad because most all of the islanders would gladly give it if you asked. They just would like you to respect that it is theirs rather than assume it’s yours for the taking. We continue up the road and just as I’m questioning if we are going the right way we see a large horned cow tied to a tree. In fact, we don’t just see one, we see three. Oh yeah, we must be on the right path. You know, because if the directions say to look for one and you see three you absolutely must be going the right way, right? Not long after seeing the cows we come to an area where there are some ancient stones and a platform of sorts. It’s here that we both feel it, the manna. Manna is what the islanders call the spirit of the island. They believe the island is filled with the spirit of their ancestors. In this place we could feel it. It’s hard to explain but you know it’s all around you. It’s a peaceful feeling but very powerful. My hair stood on end and my arms and fingers started to tingle. Dan said he could feel a presence around him as well. The moment we moved further along the trail, it disappeared. It was pretty cool. We’ve been going up this road for quite a while and I do mean up! In places it’s pretty steep and I feel like we are going up too high to find this huge waterfall. After all, if you reach the top of the mountain, where can it be falling from, the sky? We are well over an hour into this journey and it’s about this time I start questioning our path. Sure, we can still hear the river but I am looking far off to the right and I can see a huge waterfall coming of a cliff quite a distance from where we are but Captain Dan assures me we are on the right path so I keep moving ahead…up, up, up! The dirt road twists and turns with many switchbacks and each time it makes a more steep ascent Dan assures me we must be just around the corner from the falls. The further up we go the hotter it becomes as there are less trees to shade us. Oh yeah, we are quickly rising above the treetops which should be a clue we’re on the wrong road but no, Dan is absolutely certain we are “almost there”. Now almost two hours into this hike we reach a very steep part of the road. Dan is a bit ahead of me as quite frankly, I’m exhausted and running dangerously low on water. What’s that? Is it a gate ahead? No way! It appears we have hiked to the top of one of the mountains only to reach someone’s home. Are you kidding me? No ice cold waterfall or grotto to cool down in? What the heck? Dogs are barking, chickens clucking and Dan hollers to see if anyone will come out. He wants to see if he can get directions. This should be good. His French is limited to about a dozen words and given the remoteness of this House I’m guessing they speak Marquesan and French but no English. Now listening to Dan try to communicate in French is pretty darn entertaining. Most of the time it’s a lot of Spanish, a little English and a sorely pronounced word or two of French all rolled up in one sentence. Oh yeah, you really need to watch this in person to truly appreciate the humor in it. But, to his credit, he tries and they say 75% of French words are the same as Spanish only with a slightly different pronunciation. Well, with a lot of hand gestures, mispronounced words and big smiles he finds we are not only on the wrong path (didn’t I say that already?) but the falls are way across the valley on the other side. At this point there is no way we are reaching the falls today. In fact, all I want is to do is get down off this mountain, get back to the boat and find an ice cold beer and a hammock! Thank God the return trip is almost all downhill! Now I don’t want to sound like we didn’t have fun along the way and if I seem like I’m whining I’m not. We did enjoy some spectacular views of the island, we got to experience the manna around the ruins and we got some great photos along the way. And, of course, as always we enjoyed a lot of laughter. That’s something we do a lot of no matter where we are or what we are doing. In the immortal words of Dudley Moore in the movie “Arthur”, “Fun, isn’t t fun the best thing to have?” We think so anyway. I’ll never understand it but it always seems to take less time on the return trip than it does on the initial journey which in this case is perfect. I haven’t worn my trusty hiking boots in a while and I’ve amassed a huge blister on my heel. I’m so glad to see the wharf I could almost kiss the ground. Back on board Dazzler we put up our hammocks in the cockpit and kick back with a couple of frosty cold ones. Damn I love our Engels freezer. There’s nothing like a perfectly frosty cold beer after a hike to nowhere. After a little rest we decide it’s time to hop in the dink and cast a few lines. We need to see what kind of fish we can catch in this tropical paradise. We start fishing along the northern wall of the bay and follow it out to the mouth where we snake along the edge of the island. The water just a hundred feet off shore is 200+ feet deep and there’s lots of rocks so it should be good fishing. We aren’t out here more than 20 minutes when Dan hooks a fish. This isn’t some small reef fish either, it’s putting up quite a fight. I’m at the bow of the dink poised to get photos and video and the Shimano reel is making that awesome spinning sound. In the background I see ice blue water crashing on the black volcanic rocks and huge white puffs of spray shooting from the blowholes in the rocks as the waves crash upon the shore. Dan is moving side to side in the dink as this beast swims back and forth. The tip of his rod is bent over like an old man trying to tie his shoes. Soon we see the flash of silver about ten feet below the surface. Oh yeah, this is a goodly size fish here. It takes about ten minutes to get it up and in the boat. WHOLLY COW! It’s huge! First question from me is, “What is it?” It’s beautiful and silver with bright blue specs and fins. Neither of us can identify it specifically but Dan is quite certain it is of the jack family. Turns out it is a blue fin trevally We decide to take it in to the locals to find out if they are edible. Remember, you don’t eat reef fish here unless the locals say they are okay to eat. We certainly don’t want Ciguatera. We get back inside the bay and there are three locals on their fishing boat near the shore. They are fishing for bait. We pull alongside of them and show them our catch. Dan asks if they are good to eat by using the French words for food and to eat. One of the guys smiles and points to his mouth and shakes his head up and down. Dan offers the fish to them. The man says, “No, you eat, good.” Dan replies, “Est cadeau.” That means it’s a gift. The men in the boat smile big and say, “Merci”. I ask if I can take a photo and they agree. We leave them with their fish and head back to Dazzler. So you’re probably asking why we gave away such a prized catch. Well, we believe that it is good karma to give your first big catch to the locals. After all, we have a refrigerator and two freezers full of food and while we love fresh fish, this was way too much for us. These guys surely have families and this will feed them all. I guess it’s just our way of making certain we are not those type of cruisers who come and just take. We will always give back to the communities we visit. Well, it’s been one heck of a day and it certainly was an adventure. I’m exhausted and my hammock is feeling just right. Who knows, maybe we’ll try again tomorrow to find that dastardly waterfall.